The MAP-21 transportation bill was just signed two months ago, and its funding levels, agreed to by a difficult and fragile compromise between warring political parties, are already under attack. 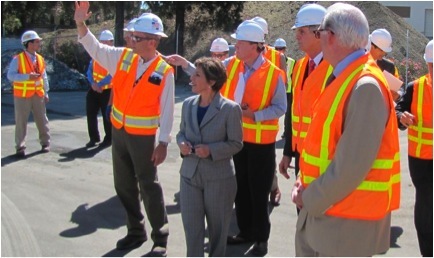 Sen. Boxer toured a BART construction project last month in San Jose. Photo courtesy of Office of Sen. Barbara Boxer. In Congress, authorization and budgeting are two different processes, run out of different committees. And right now, House budgeters are looking to shave down the $52.6 billion a year MAP-21 allocated for transportation. Sen. Barbara Boxer, who presided over the passage of MAP-21, would like to see those authorized numbers stay sacrosanct. The House’s continuing resolution would cut transportation funding half a billion dollars below MAP-21 levels. But then, in the very next line, she hedged her bets and wrote that even if the half-billion dollar cut stays in the six-month CR, it should at least be removed before any full-year transportation funding bill proceeds. The House will vote on the continuing resolution tomorrow and the Senate is expected to take it up next week.